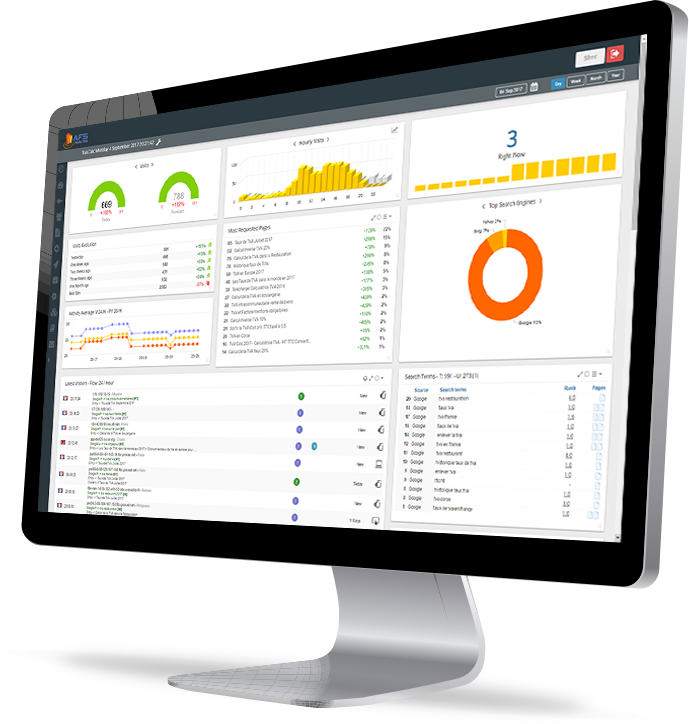 Get the best Web Analytics tool and monitor your visitor activity in real-time! Top 10 Reasons to choose AFS Analytics! I. All-in-one Real-Time Analytics: Metrics, user behavior analysis and SEO tools..
II. Your Own Custom Analytics Dashboard. Select and drag and drop widgets into your preferred order..
III. View your visitors activity with the 'right now' feature. IV Heatmaps, Understand what users want and how they interact on your website. V. Access to detailed user profile.Get a complete list of your visitors and access their detailed profiles..
VI. AFS Analytics code uses asynchronous tracking technology. Your website is protected: if our servers become slow or unresponsive the load time of your website's pages is not affected. VII. AFS Analytics offers a visitor log with detailed profile, add your own data..
VIII. EU General Data Protection Regulation (GDPR) Compliant, we respect your privacy, AFS Analytics doesn't sell or share your personal data and the data colected from your visitors..
VI. Recovering Not Provided keywords used by your visitors with AI algorytm. IX. We have not joined any program that would give the U.S. government or any other government direct access to our servers. All data transfer are crypted. X. Monitor Seach engines rankings to measure your SEO success. With our SEO tool, check and monitor your organic keywords ranking in Google, bing and yahoo..